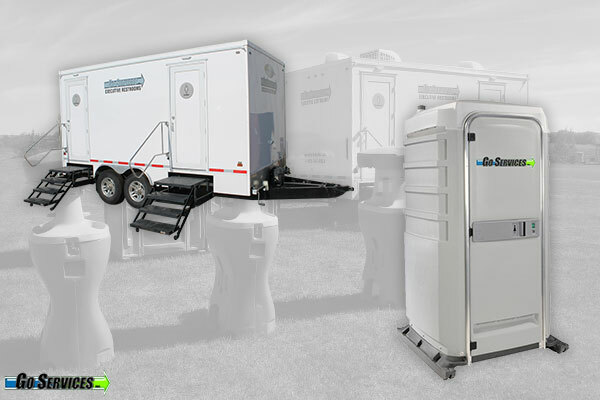 Executives vs. Portable Toilets for your Special Event | Go Services Inc. Preparing for any outdoor event can be stressful – not to mention looking after restroom units! At the same time, you want to make sure you’re staying on budget as well as keep your guests comfortable. The following are some key points for choosing between Executives vs. Portable Toilets for your next event. Depending on the size of the event, you may require a large amount of restroom accessibility. Such events may include an outdoor concert, festival or anything of the like. In such an event, Portable Toilets are likely to be your best option. Contrary to that, if you plan on hosting an event (such as a wedding) where the overall volume of individuals would be lower, you may find benefit in an Executive Trailer. We have both 2 and 5 stall models available, based on the number of guests you are planning for. Your need for ventilation may be based on climate, as well as the number of guests. Each of our units has ventilation of some kind, be it an exhaust fan, or simply a screened window. Furthermore, especially on warmer days, the addition of A/C provides a comfortable environment. Likewise, the furnaces in our Executive Units are great for those Alberta Winter weddings/events! Do You Want It To Flush? Something as simple as a flush can mean a lot to your guests. Not only does it help with potential lingering odors, but it is the overall feeling of cleanliness. This goes a long way for outdoor events that otherwise may not feel especially clean. An Executive Trailer is more than just a bathroom for your guests, it is a haven from the outdoor climates. Running water, A/C, Furnace, Flushing Toilets, etc… We have multiple options to choose from, each finished with a modern flare. Ultimately, the decision is yours. Executive units offer certain luxuries that Portable Toilets do not. However, depending on your budget and/or needs, we are confident our Portable Toilets will do the trick! We have a host of options to pick from, and we are always ready for your call! Let Us Help You make the decision.